Lutterworth Rotary Food Plant and Craft Fair. The Rotary Club of Lutterworth is one of two active clubs in Lutterworth. Rotary International in Great Britain & Ireland is a volunteer organisation where members use their skills and their time to improve the lives of others while having great fun in the process. There are nearly 1900 Rotary clubs across Great Britain and Ireland and 53,000 members. Rotary is open to anyone aged 18 and upwards. All that is required is a positive attitude and a sense of adventure. Rotary International was founded in 1905 in Chicago and is now the world’s largest international service organisation with 1.2 million professional men and women as members. There are 33,000 clubs in 200 countries and geographical areas. Rotary is also about fellowship. The regular weekly meetings held by the Rotary Club of Lutterworth provide an opportunity for members to enjoy each other's company and to develop business and social relationships. Speakers are regularly invited to introduce a topic of interest for the members and lively discussions usually follow. 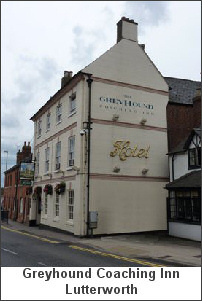 Meetings are held at the Greyhound Coaching Inn, Market Street, Lutterworth on Mondays at 12:15 for lunch at 12:30. Visiting Rotarians should advise in advance if possible so that lunch can be ordered for you. Associated closely with that of fellowship is the idea of service to the community. This takes several forms including fund raising and active participation in community projects. This may be something as simple as providing marshals for the town Feast Week. At other times, members provide helping hands in community projects, raising much needed funds for a children's hospice caring for children with life-limiting illnesses, or providing funds or equipment for world disaster relief such as the 2004 Asian Tsunami. At an international level, thanks to the active and significant financial participation of Rotarians all over the world, the scourge of Polio has all but been eliminated by the World Health Organisation. Within Rotary, we often speak of 'The Family of Rotary' and Lutterworth Rotary Club is strongly orientated towards the full integration of our families in our activities. There are regular events where partners and families may join in. Strong friendships and bonds develop between members and between families. This fellowship not only blossoms between members within our club, but with Rotarians and their families in other Rotary Clubs, throughout the Rotary District and even worldwide. Generally, membership of Rotary is by invitation. However, men and women of any age, race and physical ability are welcome to attend our meetings (other than business meetings which are for Rotarians only). Our meetings and affiliations are non-sectarian and non-political. We are more than pleased to discuss membership with those who feel that they may have something to offer our community through membership or in conjunction with Rotary. To contact us about this, please e-mail Lutterworth Rotary Club Secretary at any time. Lutterworth Santa Fun Run. £5,800 presented to Local Good Causes. Cheque Presentation Evening, March 2019. The 2019 Lutterworth Big Spin benefits Cystic Fibrosis Trust, Rainbows & other Rotary supported charities. Lutterworth Rotary welcomes two new members. Local MP opens gardens renovated by Rotary in town centre. Over 8,000 Teddy Bears now distributed around the world. Lutterworth Teddies arrive at the Little Faces School in Mombasa, Kenya.